This article was published in the February 2018 TWUA Journal. Written by Rich Oller, PE, CPM, REP and Jody Hooks, Director of Public Works at the City of League City. There has been and continues to be major repairs and modifications to Houston and surrounding communities from the aftermath of hurricane Harvey. Larger cities have processes in-place for dealing with interruptions in normal day services and treatment. In many cases these cities have emergency and backup supplies, fuel, staff and contracts with many equipment suppliers to provide the necessary supplies during a major storm event. But what about the smaller communities with limited public works staff and only a handful of certified operators to maintain their respective water and wastewater systems? So what are the key elements in getting your city or community ready for a catastrophic event that would interrupt normal water and sewer service? What types of events should you plan for? What types of supplies and readiness are required to meet these events head-on? No plan is fool proof but without a plan and training there can be no meaningful response. Practicing with different scenarios prepares the staff to respond efficiently and effectively in the moment. Having guidance to follow is extremely important to protect the health and welfare of your public. First and foremost, the safety, health and welfare of the users is the most important factor in developing a response plan. Identifying critical areas within your community such as flood prone areas, older infrastructure, roadway conditions and type, service line types and sizes are some good questions to pose in the planning process and identify on system maps. One of the first infrastructure items to lose is typically electrical supply. Know the electrical grid and major feeds and back-feed transformers and substations. Know your contact with the electrical company and supervisor for distribution in your area. Coordinate with this person early in the planning process and ahead of certain catastrophic events. Do the same with your first responders in your community and neighboring communities; get to know these people and help them throughout the year. Water supply is crucial to protect especially during flooding events. Have a plan in-place to protect pumping facilities from flooding. Likewise, if you are using groundwater be sure these are protected from flooding. If you are connected to a regional supply, coordinate your response plan with them to assure water will be available during these events. Plan a minimum use program that is published and communicated to the users in the system during such an event. Restricting water use will be necessary in many cases to conserve water for other uses such as fires, hospitals and shelter facilities. Protecting the supply from contamination is a must and TCEQ requires that 30 days of chemical be stored on-site for this reason. This in and of itself is a major undertaking for smaller communities, and certainly during an event or soon after receiving supplies and materials, is not going to happen quickly. Knowing usage rates for the various chemicals in your system and useful life or shelf life of the respective chemical is important when planning for these events. Chlorine is one such chemical that should be stored in various forms to provide disinfection capabilities during catastrophic events. Wastewater collection systems were inundated during Harvey. Flood waters often mix with sanitary sewer overflows causing a significant concern to the health of those wadding through the flood waters and or working in the flooded areas. Lift stations are extremely vulnerable to flooding and experience electrical outages. Standby generators, when connected, require fuel to maintain operations, and storing adequate fuel must be planned for and stored safely for emergency use. How much fuel should be stored is the hard question to answer! This also applies to booster stations in the system. Accessing these facilities and treatment plants is the next issue. During heavy flooding conditions what means of access do you have available? 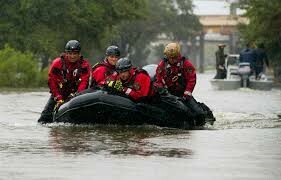 Boats and trucks capable of negotiating flood waters and debris are the typical mechanisms used to deploy personnel and access the various facilities. In many cases these devices are also being used by others in responding to emergency calls, rescue operations and by first responders. An Emergency Response Plan is the key. Catastrophic events happen, weather related, infrastructure failures, industrial mishaps and contamination, any number of incidents can occur and for small to medium sized communities is there a living plan in place to implement? Practicing with different scenarios prepares the staff to respond efficiently and effectively in the moment. Train, Train, & Train some more. Small to medium sized communities need to develop their plan based on the above key functions. Including neighboring communities and their resources is extremely beneficial. Sharing resources especially storing of critical supplies and fuel benefits all entities. In our experience as a Director of Public Works along the Gulf Coast we had an emergency plan for disasters, i.e., hurricanes, tropical storms and flooding primarily. These plans were developed for the sole purpose of documenting procedures and processes should an event occur. Our community was fortunate to have resources readily available such as high- water vehicles to use for delivery of supplies and rescues. Facilities were identified to house and shelter staff and operations personnel. Drinking water supply was projected and stored with additional back supply or alternative supplies were available if needed. Storage of water was accomplished in proactive planning with water infrastructure projects to add additional storage to our various elevated and ground storage facilities to provide emergency supply when needed. Wastewater systems become mixed as they did with flood waters from Harvey and inundate treatment plants like this one shown in a photo from the Houston area. 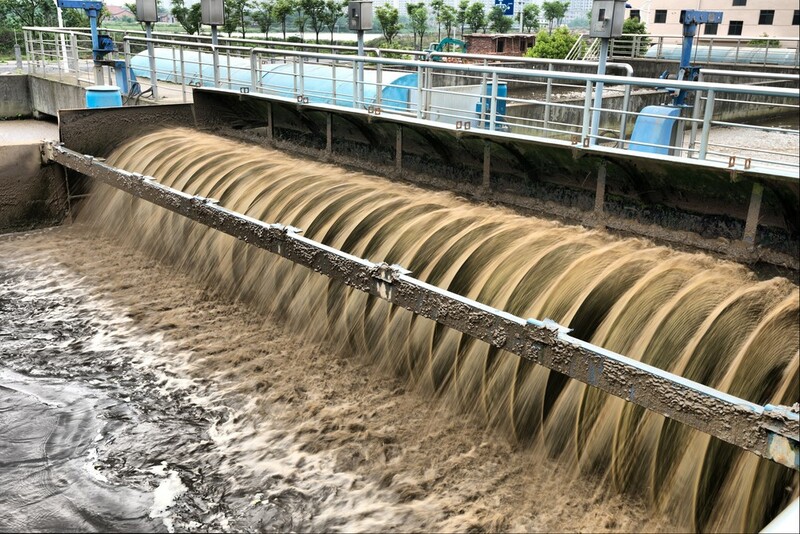 Maintaining treatment operations is crucial in providing some degree of treatment for the incoming wastewater. Treatment levels are obviously compromised during such events, but planning on how to best accommodate adverse and flooding conditions will provide a level of treatment otherwise lost. Wastewater is the hardest to secure and maintain reasonable treatment levels. Additional disinfectant can help in preventing wide spread contamination and diseases during “washout” conditions. Coordinating your planning efforts with TCEQ local and state personnel can assist in identifying best practices for these catastrophic events. Storing additional disinfectants should be planned and executed for emergency responses. No plan is fool proof but without a plan and training there can be no meaningful response. Practicing with different scenarios prepares the staff to respond efficiently and effectively in the moment. Having guidance to follow is extremely important to protect the health and welfare of your public. The many operators in Houston, during Harvey, excelled in their undeniable efforts to assure a safe utility for their respective citizens. My hat is off to each of you for all that you did in an unrelenting storm event.